SHOULD THERE BE A GOAL AMOUNT RAISED? I don't think so let's just help this wonderful family as much as possible. As a teacher you come across a students that steals a place in your heart. Cameron Forte is a student I had in my classes last year and this is exactly what he did. Because of the love I have for him and his family, I wanted to help out in any way possible. Cameron has so much courage and determination, Making him a great example to everyone. Cameron started his senior year like most high school seniors. He had set goals and was determined to reach them. He work really hard in the classroom, in the gym and on the football field. Because, of his hard work he had many Universities and Colleges looking at him to play football for them. He was looking forward to his senior year and all the activities at school. But, most of all he was excited to just spend time with family and friends. Things for Cameron changed early in Oct. while playing football for his high school team. In one of the first games of the season he was tackled and he broke his femur. Devastation set in, Universities and Colleges where no longer looking at him and his dreams of playing division one and maybe professional was just that a dream. Cameron is one of the most positive people you will ever meet. He did not feel sorry for himself, he just set his goals on different things. He excelled in school and decide it was time to serve as a missionary for his church for two years. He was excited to leave for Africa in July 2016. Since the surgery from the break his leg had always hurt and he knew something was just not right. One day he woke up and his leg was really swollen. He got an appointment with a doctor that ran test and determined it was one of two thing an infection because of the rod that they placed in his femur bone or it was cancer. Surgery was scheduled for the next day and he was told if he woke up with an IV in his neck He had an infection, if not it was cancer. When Cameron woke up from the surgery his parents standing by his beside, he felt for the IV but there was not one. He looked at his parents and said "I have it don’t I?" With tears in their eyes his parents had to confirm to him the worse possible news that he indeed had bone cancer. Once again Cameron’s dreams had been shattered he knew Africa was out of the question. He went from having everything in front of him to fighting for his life, and that is exactly what he is a fighter. Cameron has already undergone one surgery, many MRI's, blood transfusions, many hospital stays and three months of chemotherapy. In his future there will be another big surgery to replace his hip, femur, and knee. He will have six more months of chemotherapy, many many hospital stays, MRI's, physical therapy and much much more. I am asking those that can to help with the insurmountable cost that has come upon the Forte family to help with a donation. 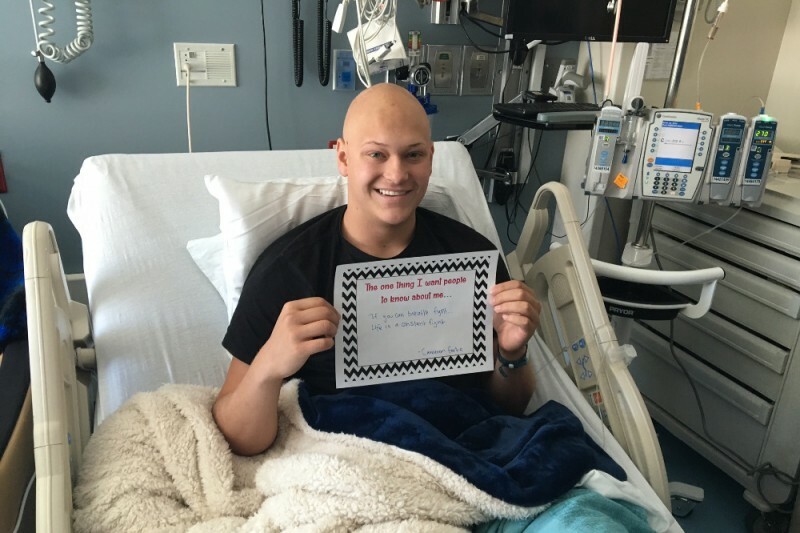 Cancer is stressful enough and if we can help alleviate the financial burden for this family so they can concentrate on getting Cameron better it would greatly be appreciated. I know Cameron will go far in life and take this obstacle and help others that is why I want to help him. Thank you from the bottom of our hearts for helping, every penny counts. Please share this go find me account with all your friends and family so that we can spread the word. Your incredibly positive attitude has inspired me and many others over the last year. Keep fighting and inspiring us!